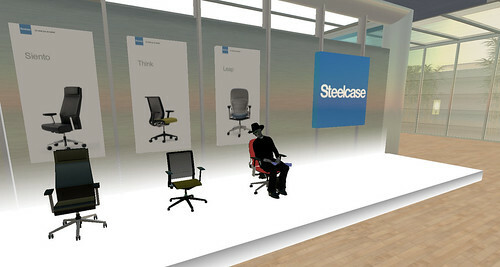 The Steelcase Store in Silicon City (slurl) will sponsor a furniture & office design showcase December 1st through 15th. Designers showcase their work will be given the chance to meet with the Steelcase Design Team in a Panel Discussion that will be held December 6th at 2:00 PM SL-time. “Q & A panel discussion on designing performance seating, ergonomics, materials, environmental sustainability, and marketing. Come to have a one-on-one conversation with the Steelcase’s Team. Future meet ups will be scheduled with the Steelcase team. Please submit your ideas for future design meet ups to Kelly Emms. *Designers can submit, chairs, desks, lighting, cabinetry, interior spaces dividers etc. Space Limited. 100 prim limit for each piece submitted.